Hello everyone, happy 2012! In another 6 days’ time, we will be celebrating our Lunar New Year. Happy Lunar New Year to the Chinese friends and readers. Wishing everyone a Prosperous Dragon Year. This is a ‘festive cookie’. 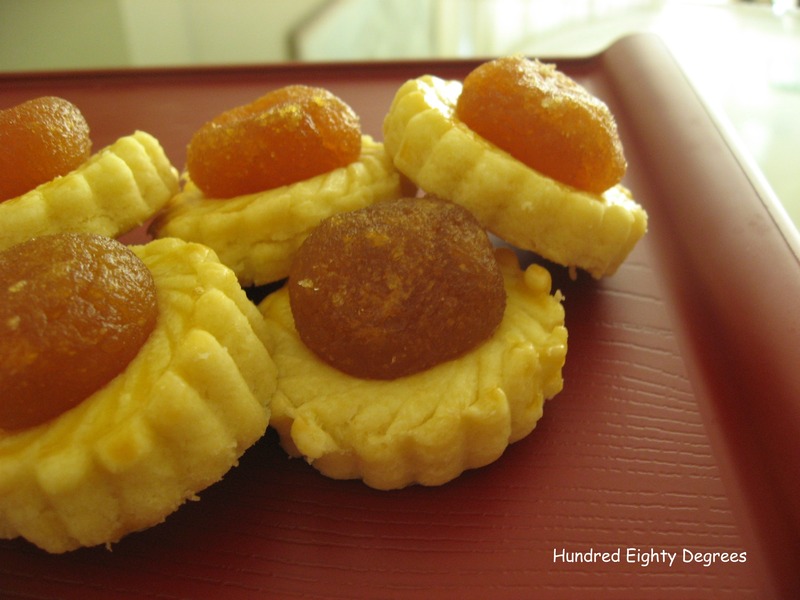 Nearly all Chinese household will have pineapple tarts at home as pineapple in dialect means ‘wealth coming’. I have been contemplating to make own pineapple fillings, but in the end I couldn’t resist of buying ready-made ones due to convenience and time constraints. I made two different pastries and both turned out equally excellent. Both have the melt-in-your-mouth textures which I like. I would say the pastry for open style was buttery while the closed style was creamy. The only downside with the closed style was the pastry was a little flaky. So, it was quite a challenge to stack them without messing up. Source : Click here for original recipe from The Little Teochew. Recipe below has been doubled and with slight modifications. 1. In a large bowl, sift plain flour, corn flour, icing sugar and salt. Add in butter cubes. Do not further process. Chill the bowl of mixture, covered in the fridge for 30 mins or you can prepare this the night before. 3. Beat together egg yolks, cold water and cognac or vanilla extract. Add it into the butter-flour mixture. Do NOT knead. Use spatula to gently press all the crumbs into one large dough ball. If need to, use your finger tips to gently bring them to form a dough ball. Do not over-do it, stop when the crumbs come together. Chill in the fridge for about 10 mins, covered. 5. Place the pre-rolled pineapple paste balls onto the center of each tart shell. 6. Bake at preheated oven at 160 degrees celsius for 20 minutes. 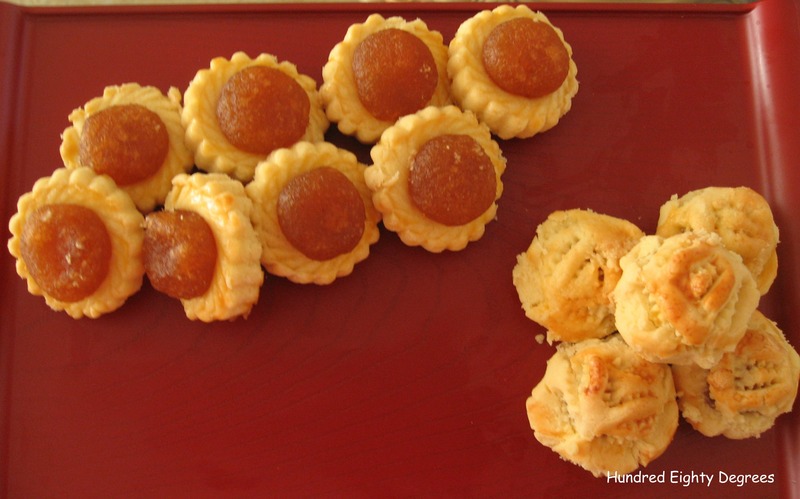 Here you go, another pineapple tart recipe that uses ghee instead of butter. Super Melty Pineapple Tart (close style). I made 1.6 times of the recipe in order to use up the whole can of 400g QBB. Click here for a smaller portion. 1. Using a hand whisk, cream QBB and sugar until light. Whisk in egg yolks 1 at a time until well combined. Add essence and salt and whisk until fluffy. 2. Sift top flour and corn flour together and fold into the QBB mixture to form a soft dough. 3. Divide dough using a tsp and roll into balls. 4. Flatten a piece of dough and place a piece of the roll pineapple paste in the middle. Bring the edges of the dough together and press lightly to seal. Roll it in between your palms to shape it into roll. 5. Place rolls on baking tray lined with parchment paper or paper casing. 6. In a small bowl, mix the egg yolk, salt and water together for the glaze. 7. Brush the glaze on the pineapple rolls with a brush. 8. Bake in preheated oven of 180C and bake for 20-25 mins or until the rolls are pale golden brown. 9. Cool on wired rack before storing in airtight container. 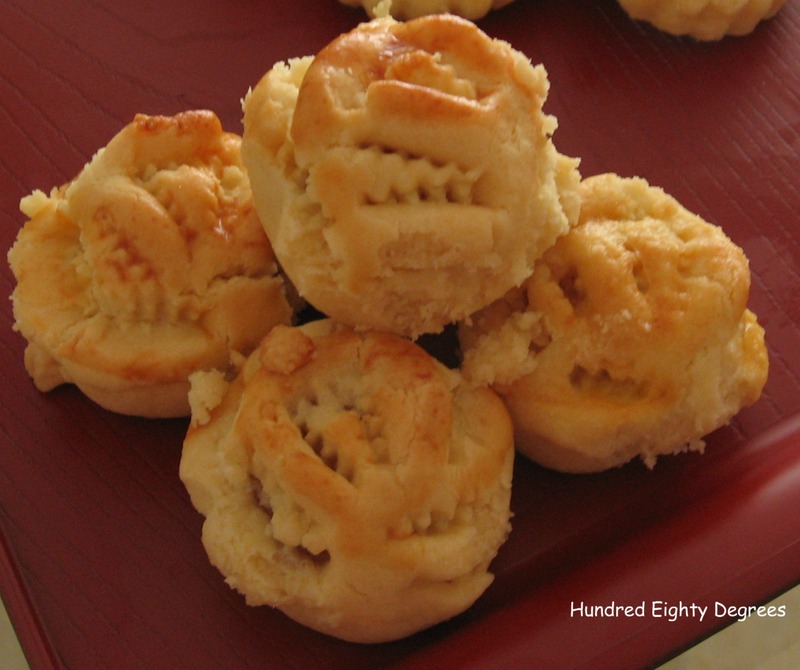 Your rose pineapple tart (closed) recipe is wonderful. The tart shell is buttery and melt in your mouth crispy. Thanks! Earlier i thinking to make own pineapple filling, but at the end still bought the ready made one, hehehe..
Hi Eileen, you’ve been MIA for long time? First of all, I would like to wish you Happy new year, wish you all the best in 2012. Your pineapple tart sure looks tempting and delicious. I love the round rose pattern. I’m still busy baking, haven’t complete. Have a nice day. Hi Amelia, thanks for visiting ^_^. I have been quite busy lately, spring cleaning, cookies baking, shopping etc. I’ve lined up a series of CNY cookies post and should be posting them daily before the new year..You too have a nice day!